I consider myself the queen of leftovers. This recipe should prove it. Bake an extra sweet potato for dinner the night before and voila! A high fiber, high protein, delicious breakfast is served. NO added sugars required! Reheat the sweet potato in the microwave (45-60 seconds is sufficient). 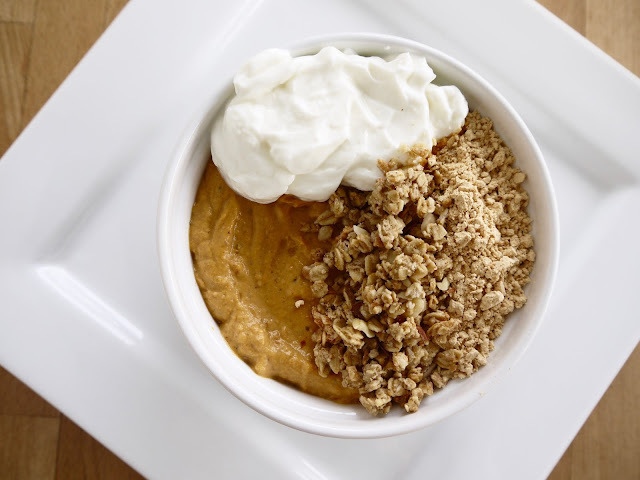 Add sweet potato (with skin) to a large food processor and add 6 oz Greek yogurt and cinnamon. Mix until a smooth puree is formed. Transfer mixture to a bowl, then top with remaining 2 oz Greek yogurt, granola, and powdered peanut butter. Other topping options include sliced bananas, hemp seeds, chia seeds, or pumpkin seeds.